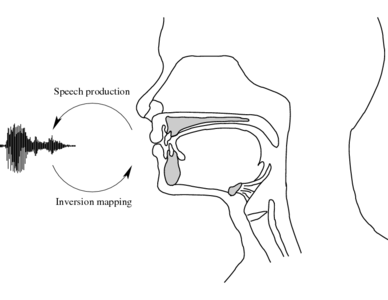 This inversion project aims to estimate the articulatory movements which underpin an acoustic speech signal. Humans produce an audible speech signal by moving their articulators (e.g. tongue, lips, velum etc.) to modify and "sculpt" a source of sound energy in the vocal tract (e.g. air turbulence or vocal fold vibration). In performing the inversion mapping, we aim to invert this forward direction of speech production. In other words, we aim to take a speech signal and estimate the underlying articulatory movements which may have created it. Speech is transmitted between humans in the acoustic domain, and fortunately, we can easily measure and record that acoustic representation. Underlyingly, however, the acoustic speech signal is the product of events in a speaker's articulatory system, and there has long been interest in ways to exploit the underlying articulatory information for speech technology. An articulatory representation has certain attractive properties which might be exploited to help in modelling speech. Speech articulators move relatively slowly and smoothly, and their movements are continuous. The mouth cannot jump instantaneously from one configuration to a completely different one. Using speech production knowledge could help improve speech processing methods by providing useful constraints. Suggested applications include, for example, automatic speech recognition, low bit-rate speech coding, speech analysis and synthesis, and animating talking heads. To use articulatory information in speech processing applications, the articulatory representation itself must somehow be obtained. In recent years, several methods have been developed to measure articulatory movements, such as X-ray microbeam cinematography, Cine-MRI, ultrasound, electropalatography and electromagnetic articulography (EMA). The last two of these in particular are safe enough and cheap enough to enable us to record reasonably large amounts of articulatory data (e.g. the MOCHA TIMIT EMA corpus ). This in turn means the use of machine learning algorithms in common use today in speech technology is viable. However, although it is now possible to record larger quantities of articulatory data, it unfortunately does not mean it is convenient. All current methods are relatively invasive and require bulky specialist equipment. Therefore, being able to estimate articulation from the acoustic signal alone, aside from being a theoretically interesting problem in itself, would also provide a convenient route to obtaining an articulatory representation of speech for many applications. Subsequently, we have extended the mixture density network to provide a full conditional trajectory model, which we have termed the Trajectory Mixture Density Network (see papers 2 and 4 below). The following publications predate the current project, but are included here for completeness, since they describe work upon which the present work is founded.